Chicago Metallic has built an unmatched reputation as the "Bakeware Experts" by delivering commercial quality, high performance products employing premium materials and construction. Chicago Metallic is proud to introduce Commercial II, a top of the line assortment of bakeware. Offering both traditional uncoated and dual coated, diamond-quality non-stick bakeware, the Commercial II line provides the strength and durability to craft delectable results day after day. The entire line is made of heavy-weight aluminized steel for superior heat conduction and even baking results. The Lifetime warranty ensures the avid baker sturdy construction and product longevity. This collection is dishwasher safe, however hand-washing is recommended to extend the product life. This Chicago Metallic Commercial II non stick small cookie/jelly pan is strong and durable with long-lasting construction. A wire rod reinforcement prevents warping. It measures 13 x 9-1/2 outside dimensions, baking area measures 12-1/2 by 8-3/4 by 1-Inch. IDEAL FOR BAKING MULTIPLE DISHES: The Chicago Metallic Non-Stick Baking Sheet is ideal for all types of baking and cooking. Have the flexibility to bake jelly rolls, bars, cookies, one-sheet pan meals, roast vegetables or reheat leftovers. CONSISTENT HEAT DISTRIBUTION: The baking sheet is made from heavy-weight aluminized steel to evenly disperse weight and heat for consistent baking results. Suitable for all oven types. NON-STICK COATING FOR EASY RELEASE: Commercial II Non-stick Bakeware features an exclusive grade of dual-layer, diamond-quality nonstick finish. The non-stick coating calls for exceptional abrasion resistance, baked good release and easy clean up. 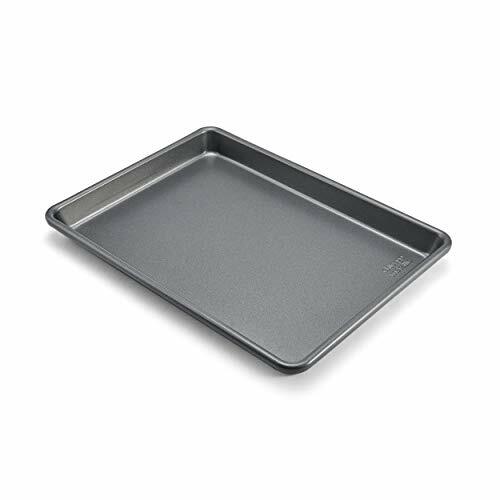 THE PERFECT SIZED BAKING SHEET: The sheet features a wire rod reinforced rim to prevent any warping. Outter dimensions measures 13" x 9.5" x 1"; inner dimensions are 12.25" x 8.75" x 1". SPACE SAVING STORAGE: This non-stick baking sheet is easy to store and can be stacked within other baking sheets, making it a great space saver in the cupboard, drawer, or countertop rack. DISHWASHER SAFE FOR FAST CLEAN UP: This baking sheet is dishwasher safe, making clean up fast and easy, however hand washing is recommended to extend product life.